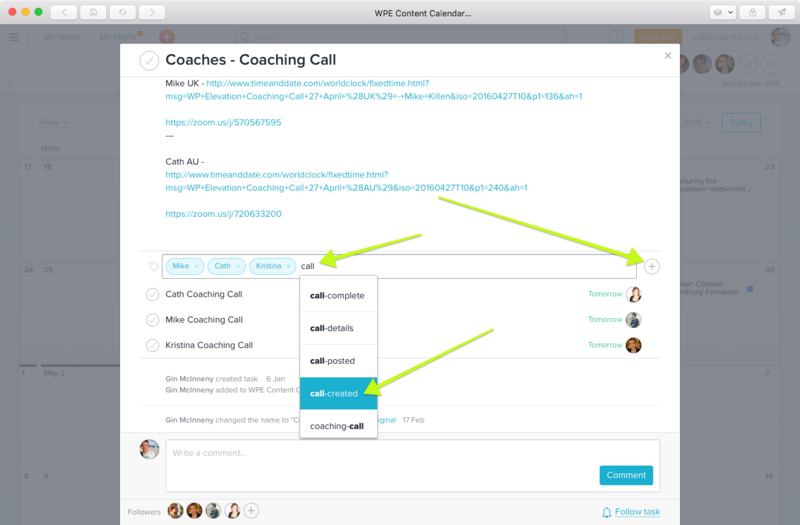 This process will help you set up a coaching call or webinar for the coaches. 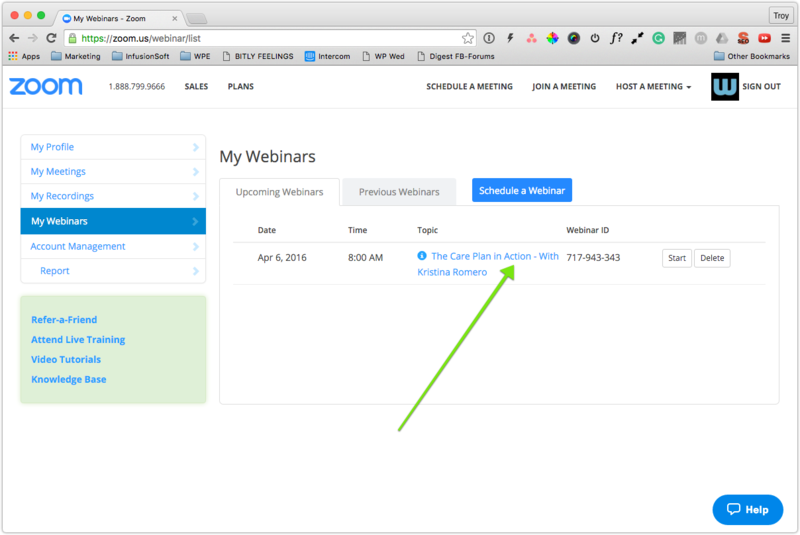 9 Check Correct Email in "Manage Webinar"
Each week we run a webinar or a coaching call for our members to help them in their business. These calls are facilitated by our coaches. 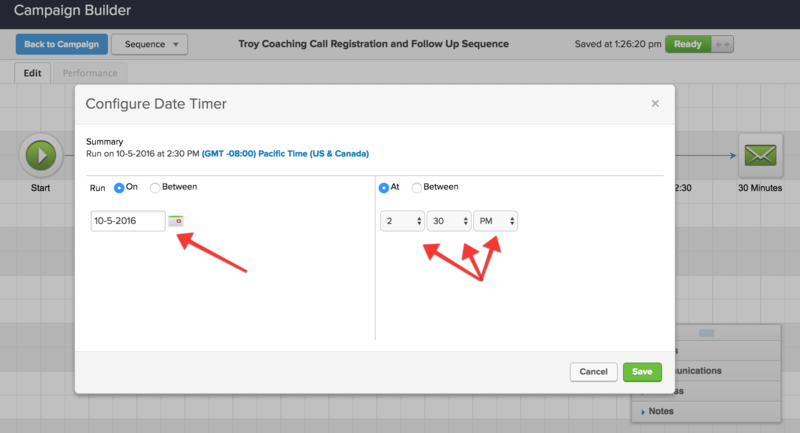 To help the coaches out, we set up the calls for them using Zoom.us, convert the call into different time zones and promote the call to our members via email and the members website. 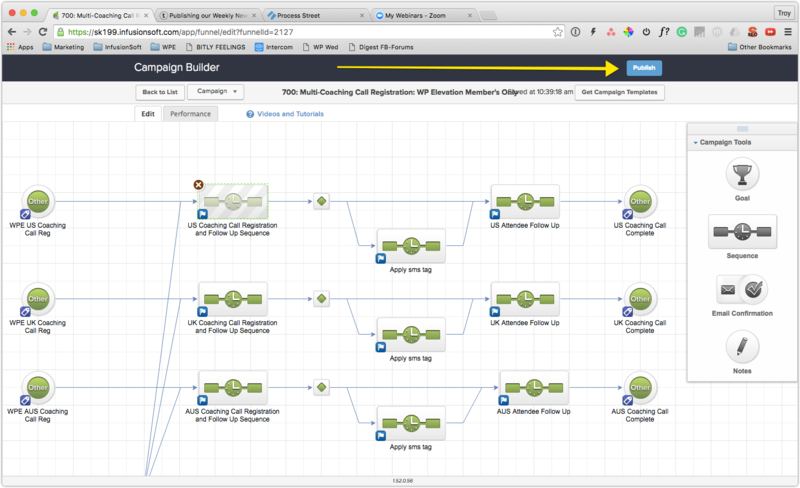 This process is the same if you are setting up one call or multiple calls at the same time (for example when the three coaches run a coaching call on the same day). This process is triggered by Zapier when a task is tagged in Asana with the "call-details" tag. 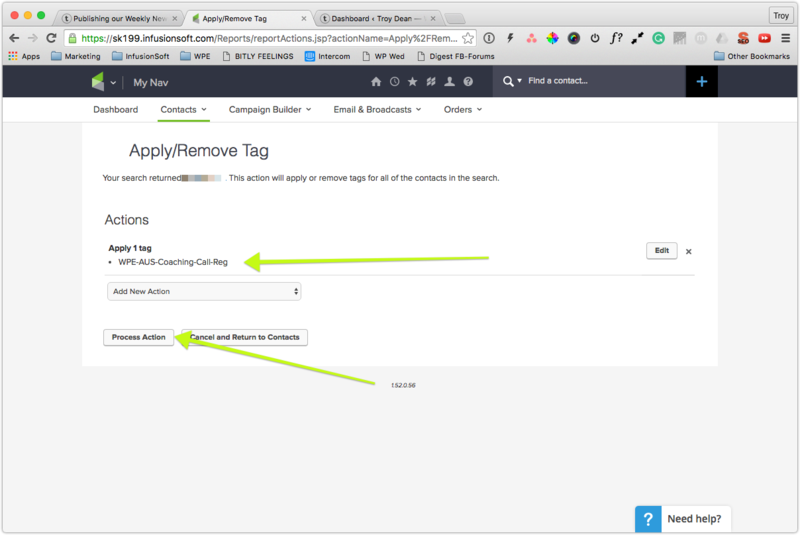 This tag is applied in Asana by the host of the call once they have added the title and summary of the call in Asana. At this point, all of the information is ready and the call can be setup in Zoom and promoted to our members. Choose below which coaching call or webinar are you setting? 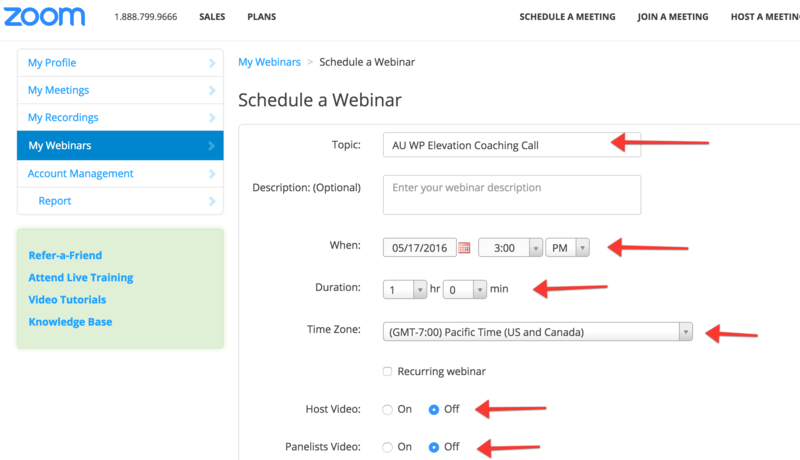 The process for the coaching call / webinar you picked is in the left menu. Login to Zoom with the logins from the 1Password Vault. 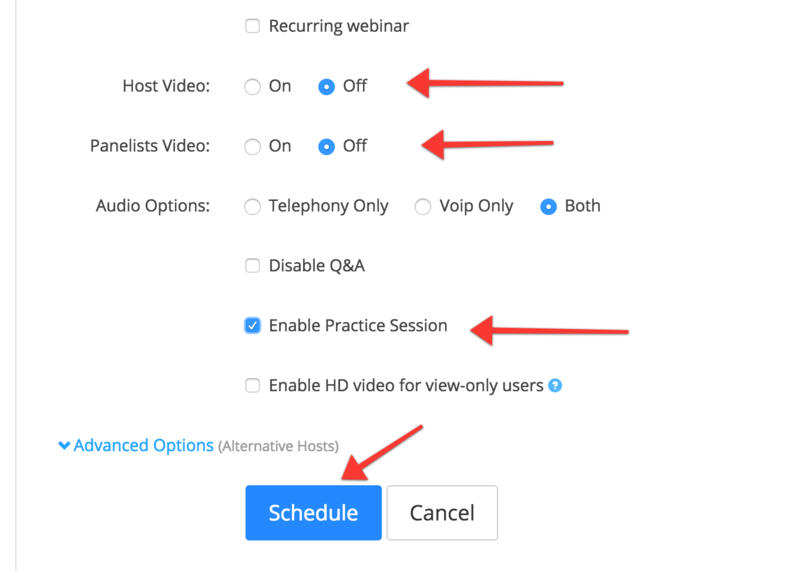 Make sure Host Video and Panelists Video are set to off. Tick Enable Practice Session and hit the Schedule button. 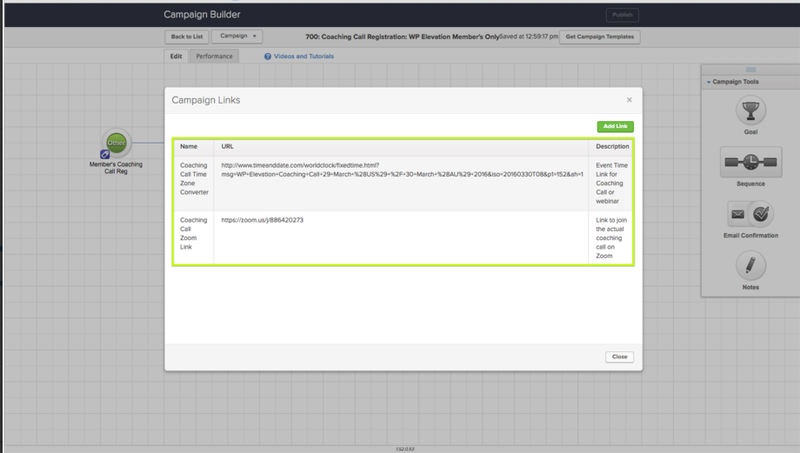 NB: All coaches share the same login details. 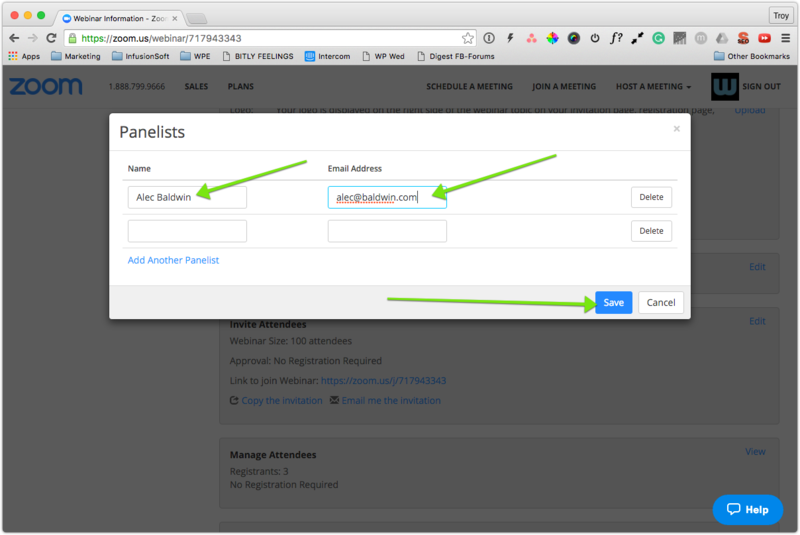 If you are heading a guest presenter to this webinar, click the name of the webinar to edit it and then click the edit link in the Panelists section. Enter the panelists name and email address and they will receive an email and be added to the call as a panellist. 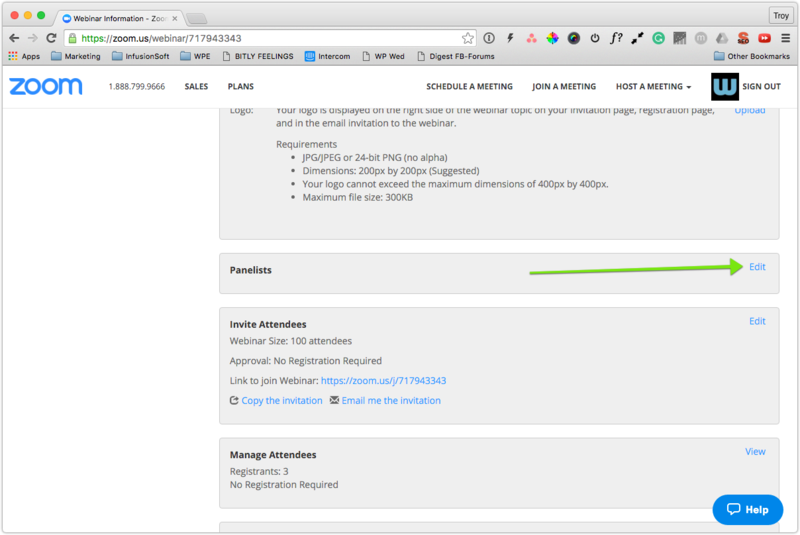 Confirm that the call does not require attendees to register. 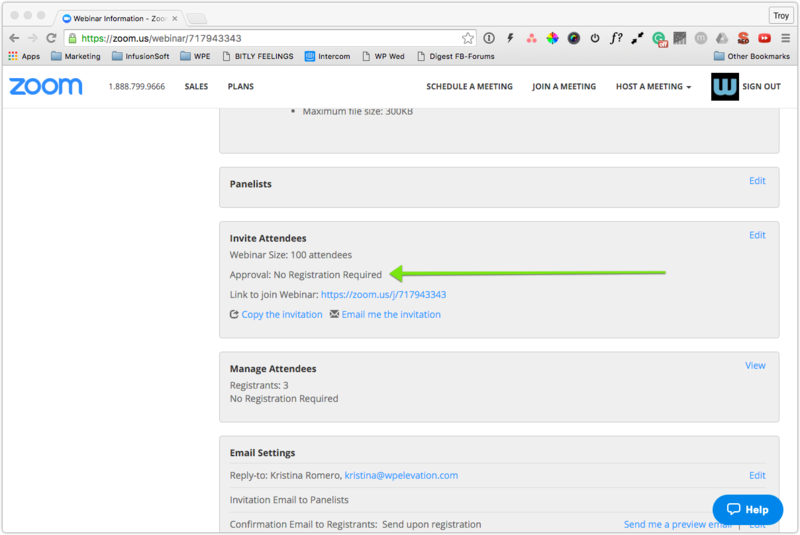 This means that we will register all of our members for the call without requiring them to fill in a registration form. This increases the number of people we have attend each call. Click on the name of the call to edit it (or go to "Manage Webinars") and then scroll down to the Invite Attendees section and make sure No Registration Required is selected. 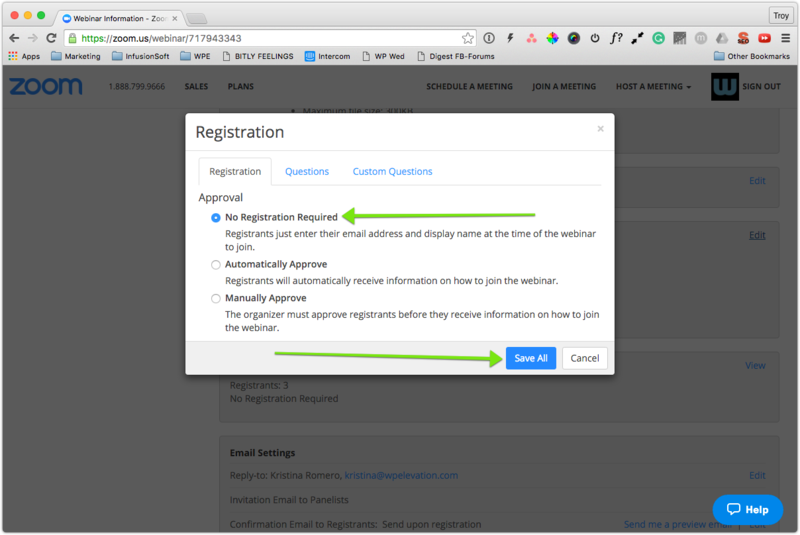 If registration is required click the edit link, and change this setting. 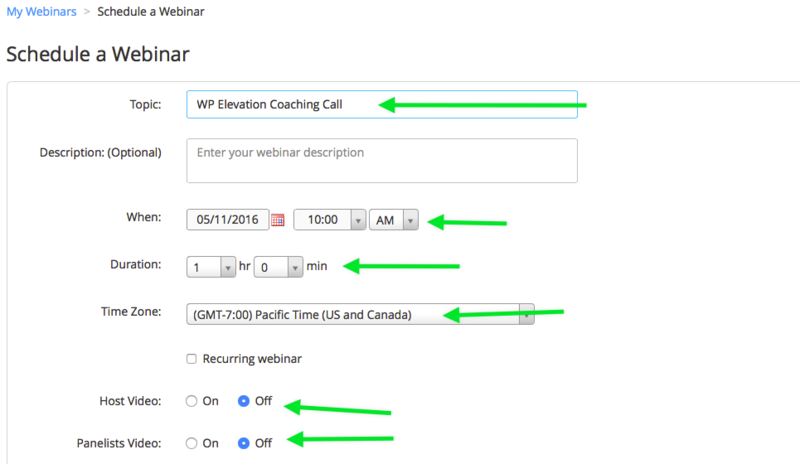 Check Correct Email in "Manage Webinar"
In the setting "Manage Webinar" which you should be taken to once the call has been set up, you will need to make sure the email address is set to that of the coach / person conducting the call. 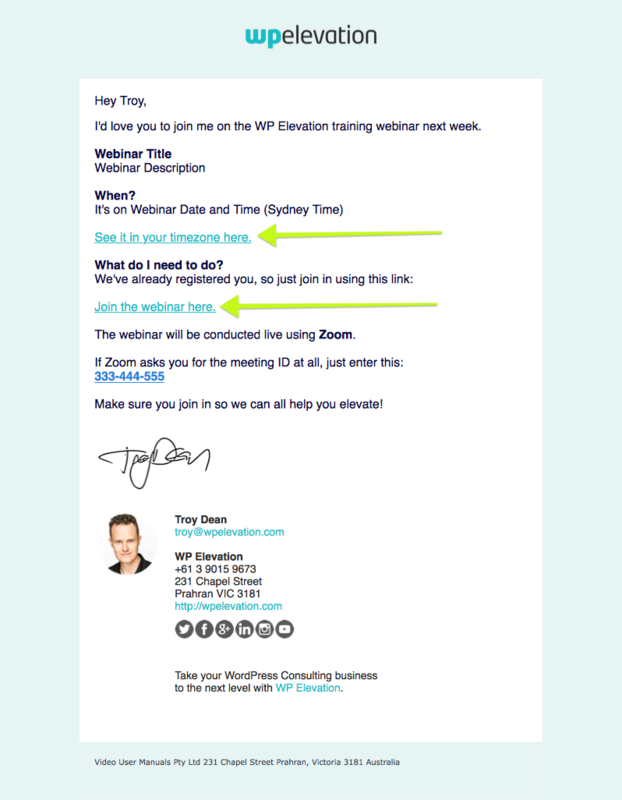 If Troy is taking the call, the call will be set up using his's Zoom account ([email protected] ) and it should appear by default. 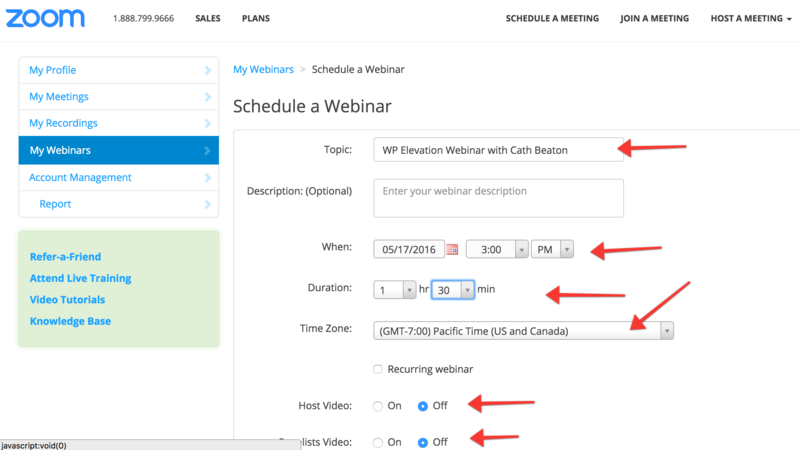 Once you are happy that the call is set up correctly, click on the name to edit the call and scroll down to the Invite Attendees section and find the link to join the webinar. Copy this link and paste it somewhere on your desktop for now as we will be using these links in a moment. In this section we are going to convert the time of the call into multiple time zones to make it easier for our members to see when the call is on. Enter the name of the event as the same as the name of the call. Enter the location of the event as city of the coach running the call. 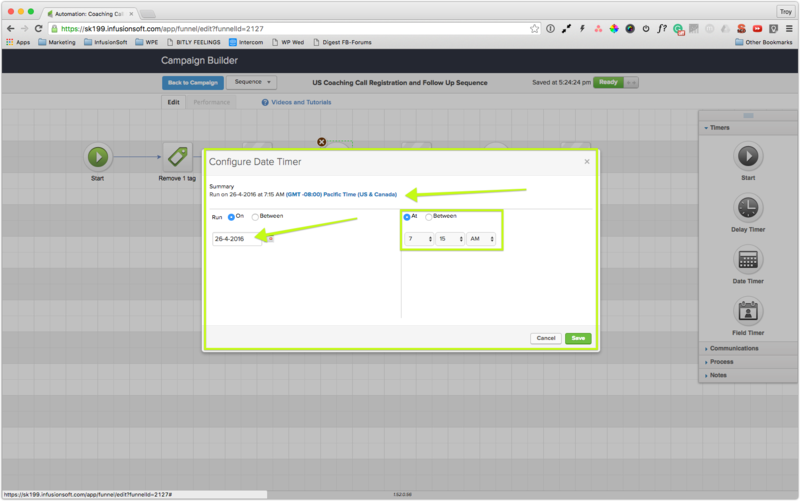 Enter the date and time of the event as the same date and time you set up in Zoom. 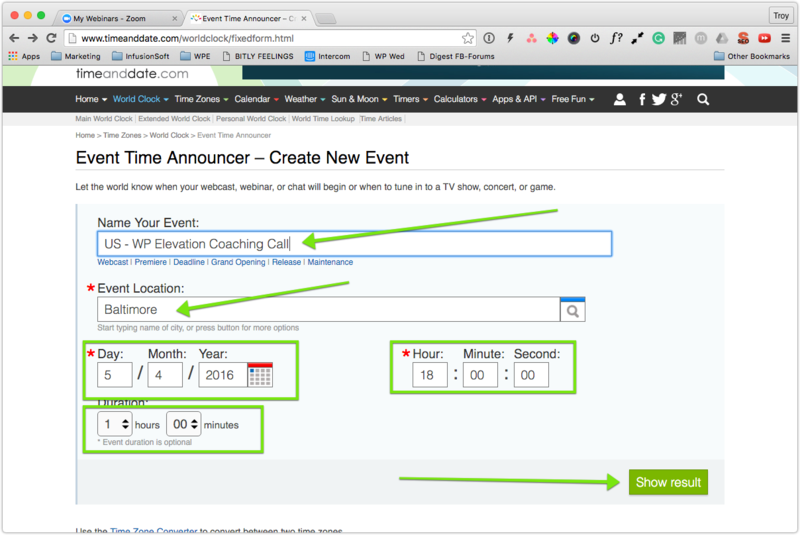 Enter one hour as the duration of the event if it's a Coaching Call and 1.5hrs if it's a webinar and then click Show Result. See the screenshot below is an example. 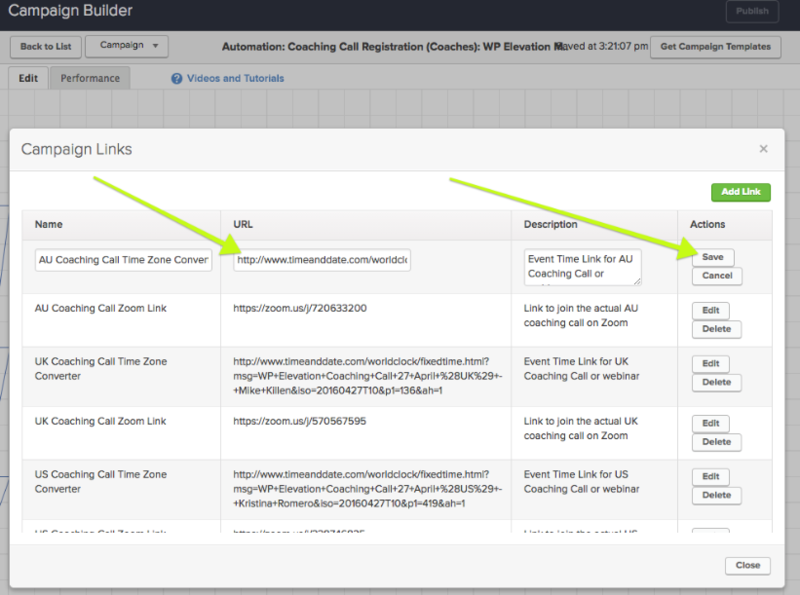 When you click on Show Result you will be taken to a page that shows the call in multiple time zones around the world. Double check that the time is correct by checking the times in some of the cities on the list as well. Copy the URL of this page and paste it somewhere on your desktop for now as we will be using them in a moment. 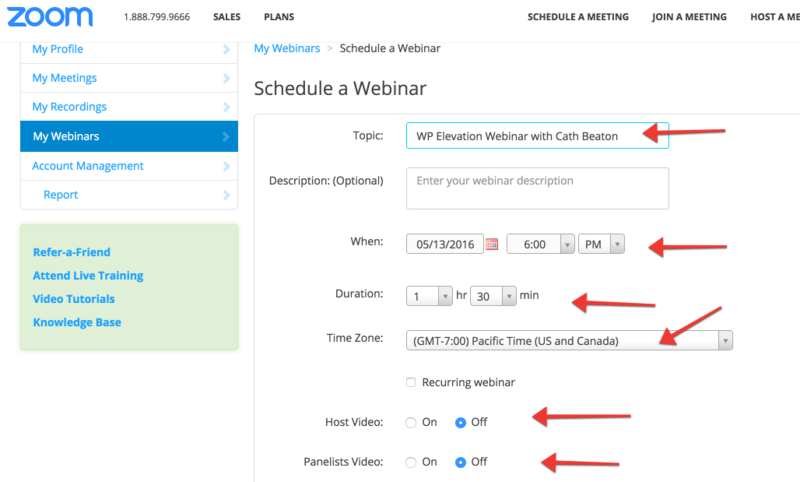 Paste the links below from the Time and Date time zone conversion and the actual link to the call in Zoom for each call you are working on. If you are only working on one webinar or one coaching call then you will most likely only have two links to paste in here, one for the time zone conversion and one for Zoom. 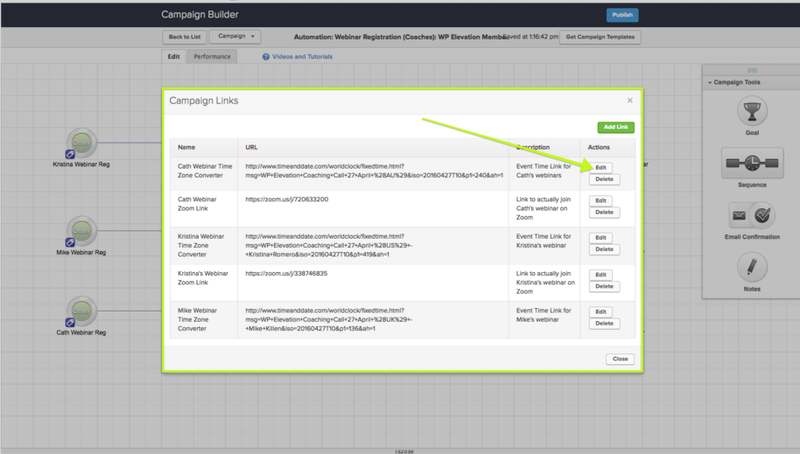 You will use these links shortly as Campaign Links in Infusionsoft. Now that the call is all set up, it's time to promote the call to our members. 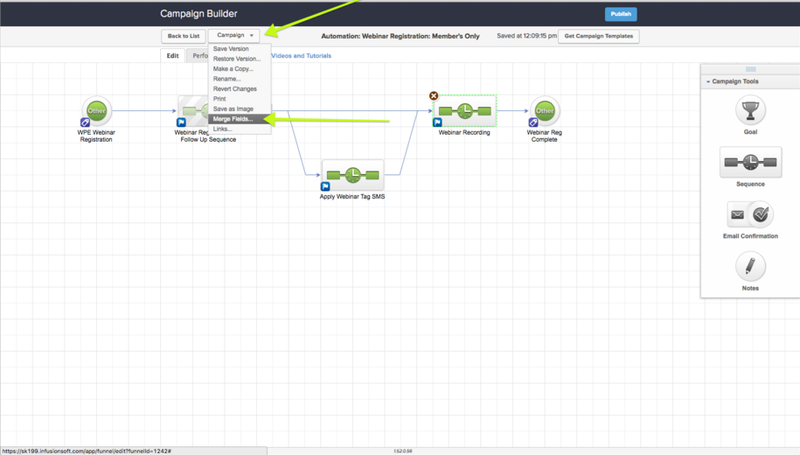 We do this by sending an email from Infusionsoft. Login to Infusionsoft and find the correct campaign for promoting this call. 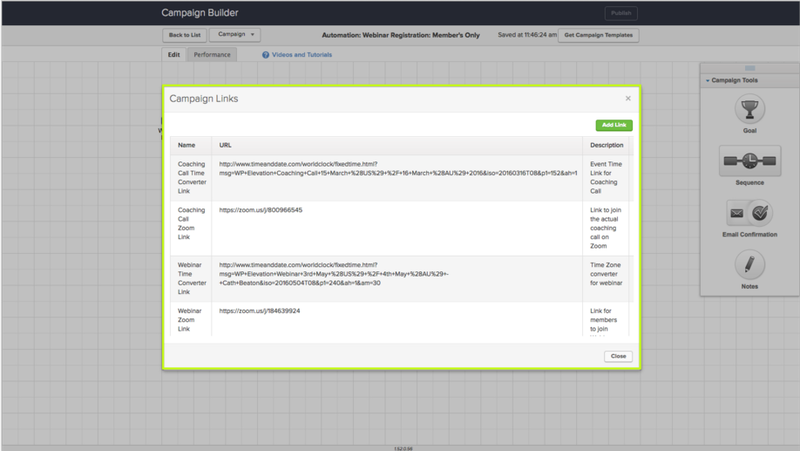 Each campaign in Infusionsoft includes links and fieds that are placed within each email. 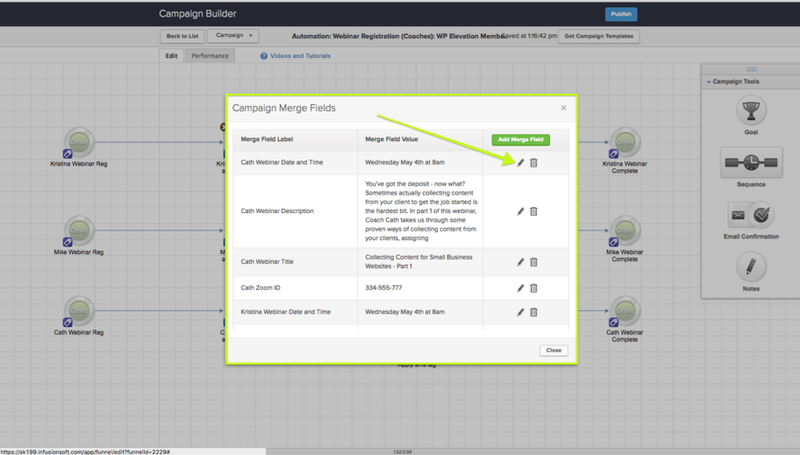 These are called Campaign Links and Merge Fields and make it easy to update all emails by changing the information in one place, rather than having to edit each email. From the Campaign dropdown, choose Links in order to edit the Campaign links. 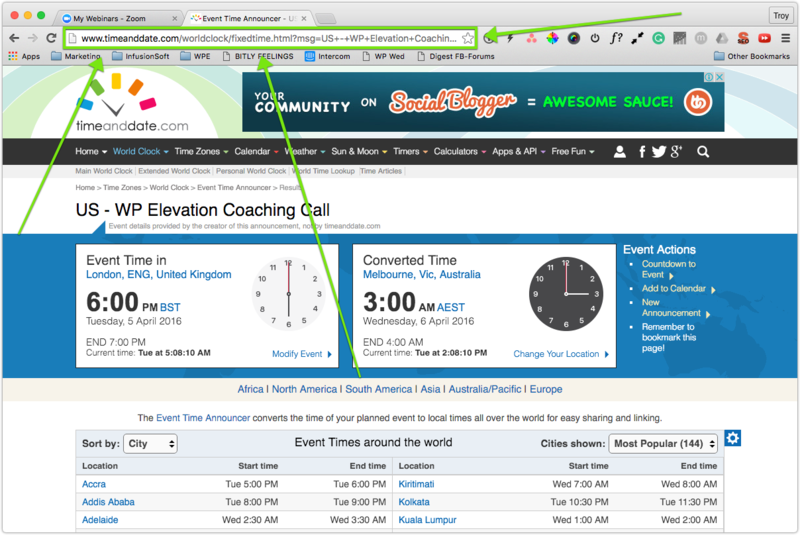 These are the links you stored previously for the Zoom call and the time zone conversions. 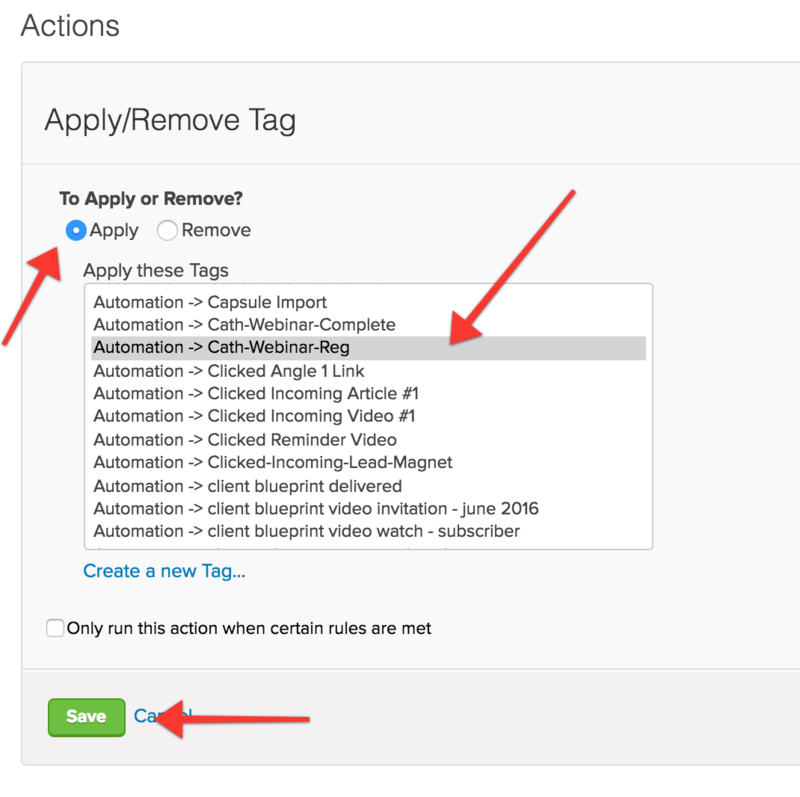 Edit each link by clicking the Edit button, adding the new links to update the link, and then choosing Save. 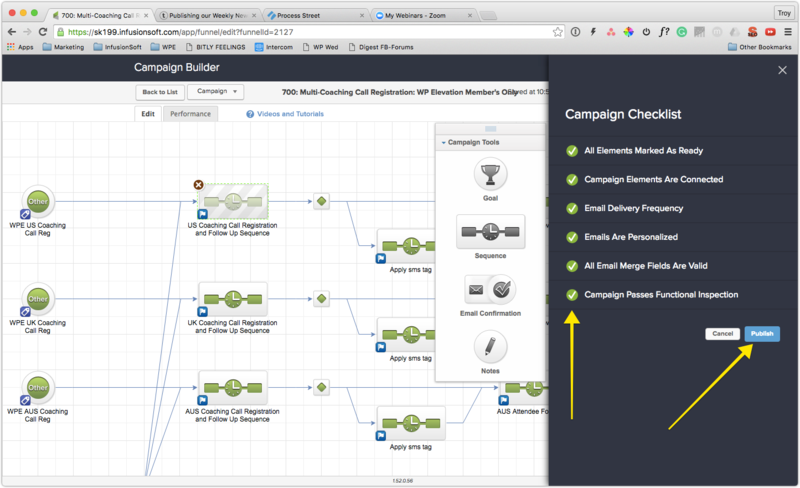 Here is a screenshot of an email to show you where the campaign links are situated. From the Campaign dropdown, choose Merge Fields in order to edit the merge fields. 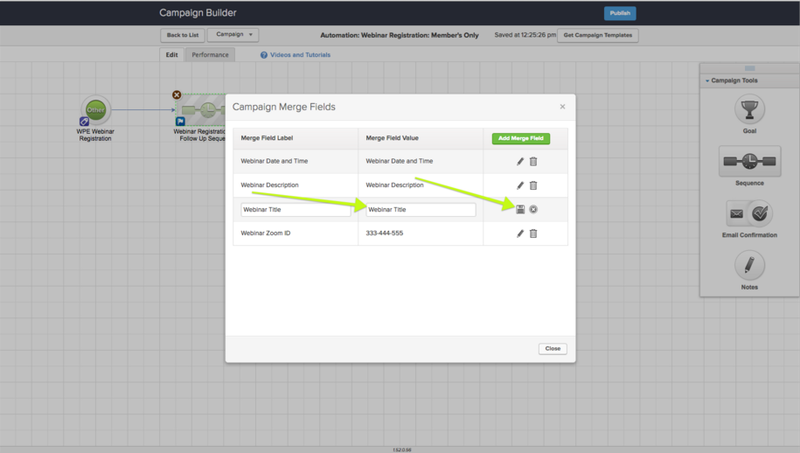 Edit each merge field by clicking the Edit button, adding the new information and then choosing Save. 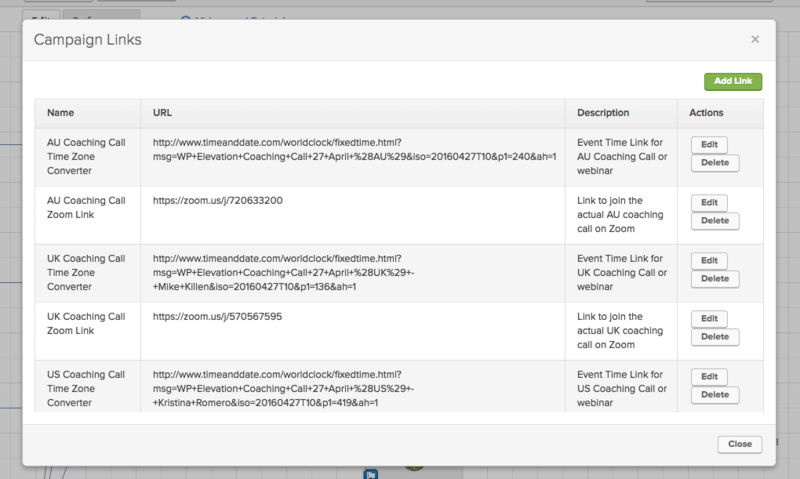 The information for the Webinar Title and Description will be in the Asana Content Calendar. The Date and Time should always be entered as Sydney Time. The Zoom ID you will have saved earlier in the Store Links task. 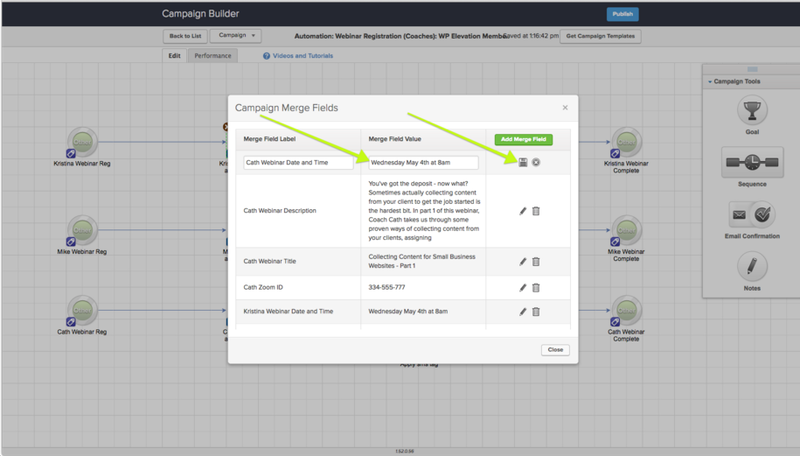 Here is a screenshot of an email to show you where the merge fields are situated. Edit the dates on when the email should be sent out. 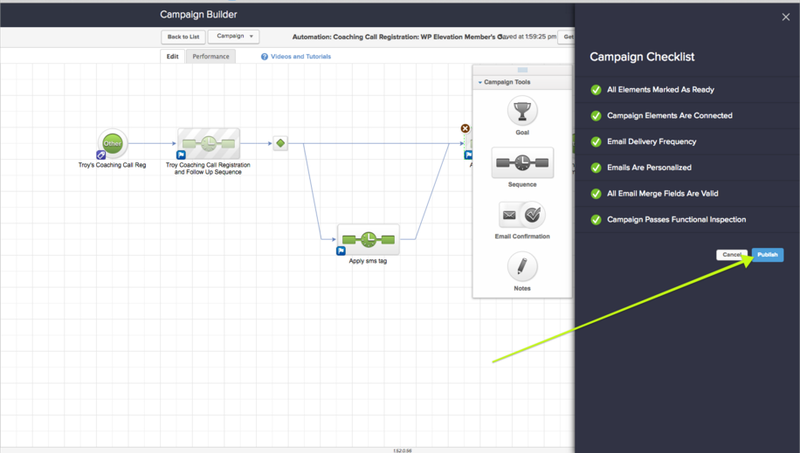 Start on the calendar icon on the far right , just before the "30 minutes" email icon. Followed by the calendar icon that appears before the "Day Before" email icon. 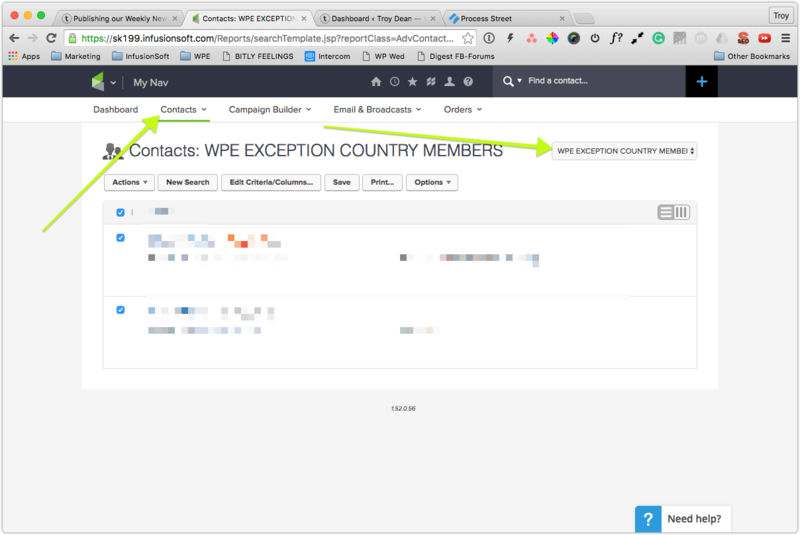 When you have made all the changes to the emails, double click on the Welcome Email icon and click on the "Send Test" button on the upper right side of the page, choose your name to send a test to yourself to see if the merge fields values appears correctly. 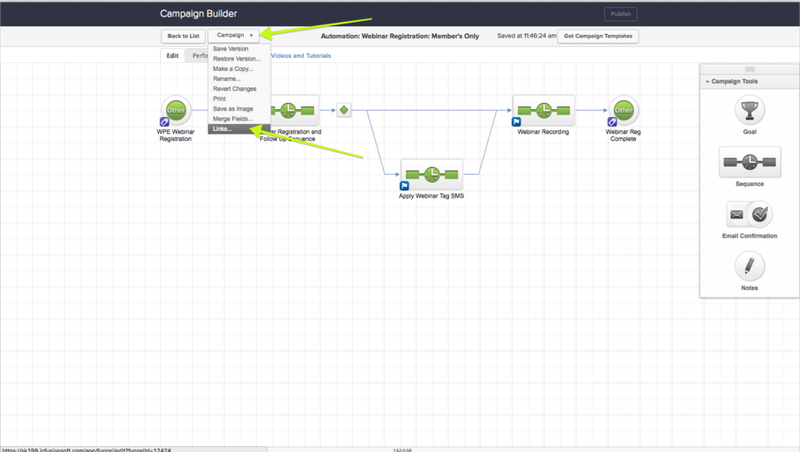 When you have made all the changes to the emails and sent test emails to double check the links and the details, then publish the campaign by choosing the publish button and then confirming you want to publish. 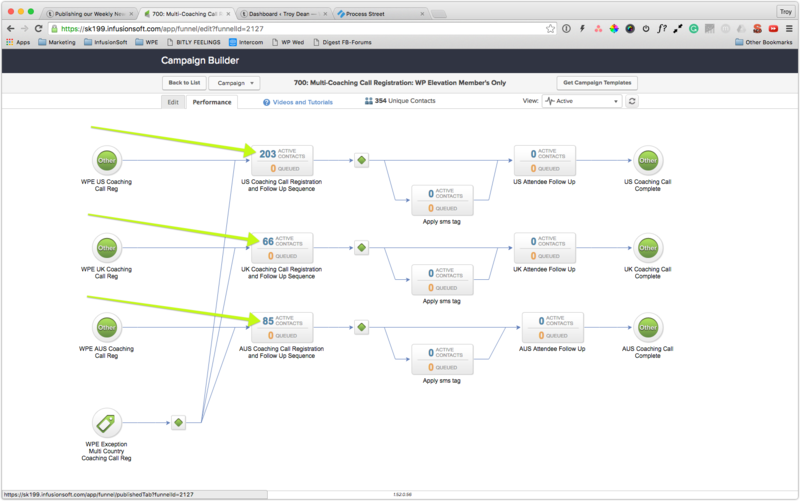 There should only be 4 merge fields relevant for each webinar. 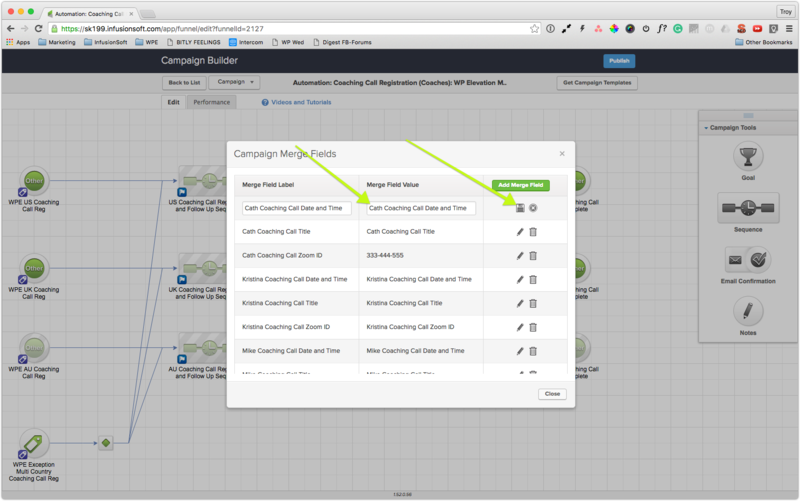 Each campaign in Infusionsoft includes links that are placed within each email. 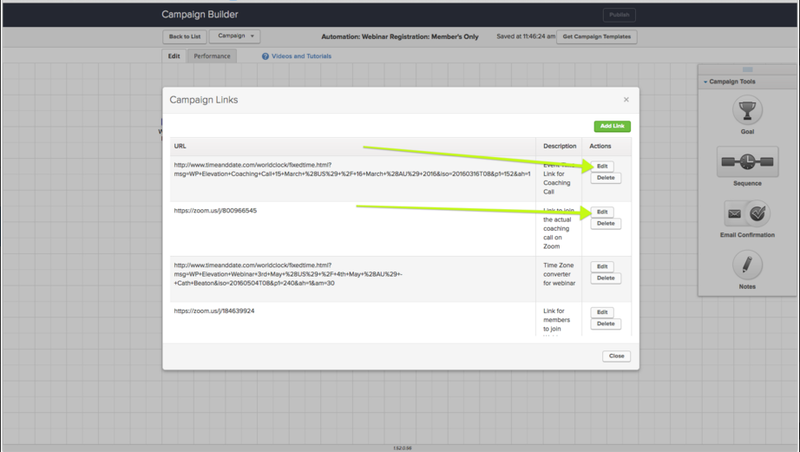 These are called Campaign Links and make it easy to update all emails by changing the link in one place, rather than having to edit each link in each email. 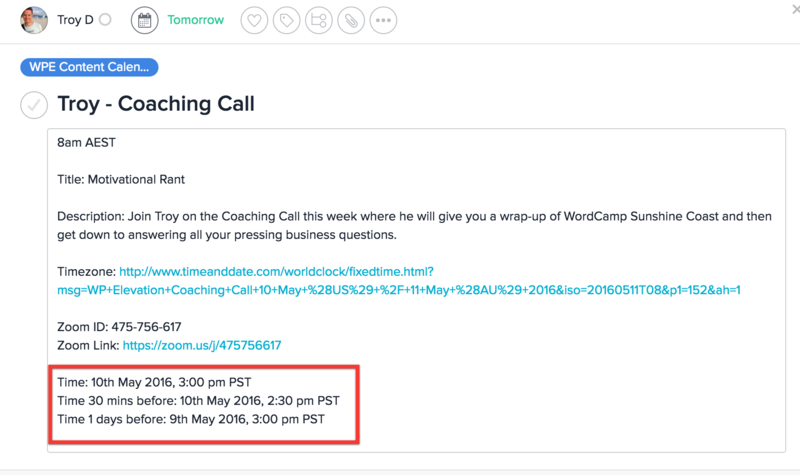 The information for the Coaching Call Title and Description will be in the Asana Content Calendar. 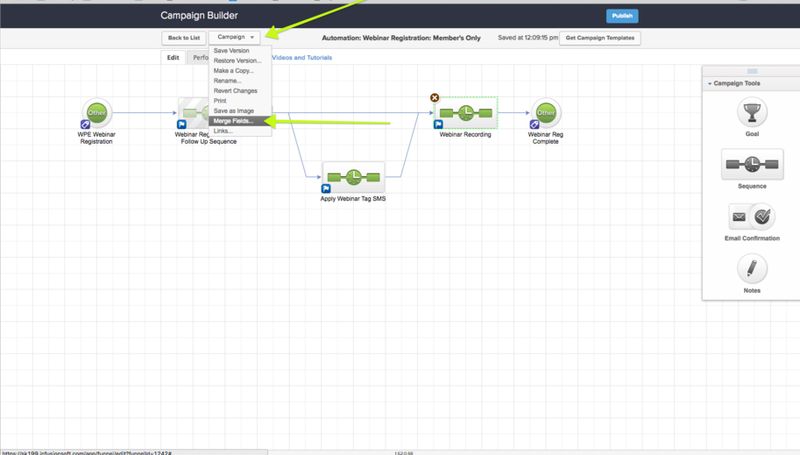 then publish the campaign by clicking the publish button and then confirming you want to publish. Towards the end of each month, we run three separate coaching calls; one in the US, UK and AU that the coaches facilitate as a way of catering for our global audience in their relevant time zones. 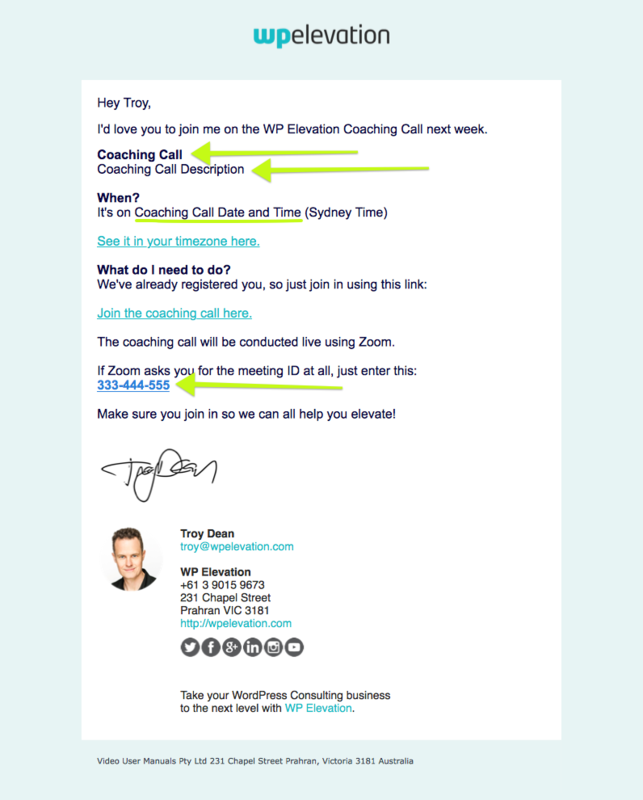 The process for promoting these calls is exactly the same as promoting Troy's call, however we need to update more Campaign Links and edit more emails. 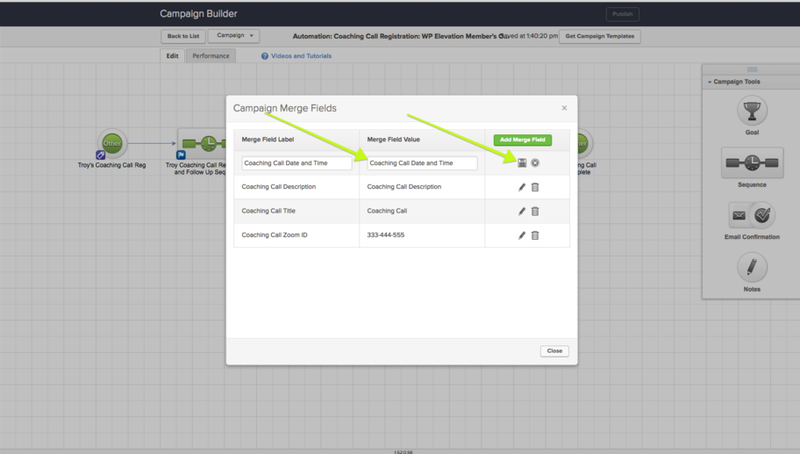 All 9 merge fields need to be updated for this coaching call. 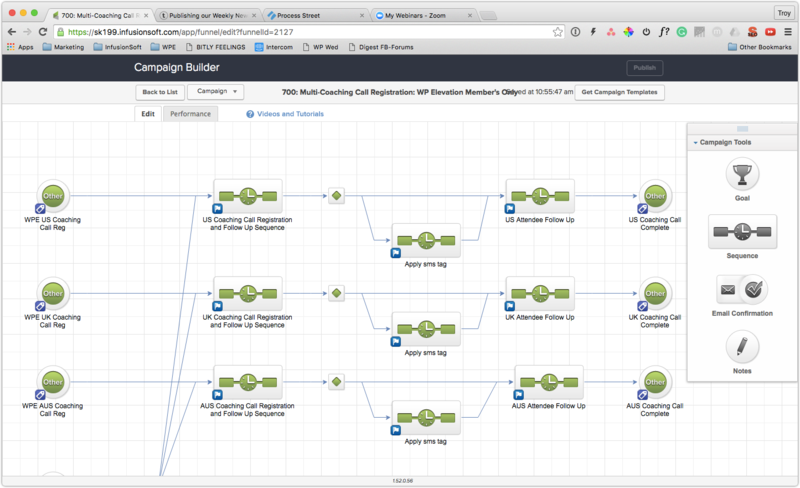 This campaign also includes three sets of sequences that need to be updated. Again, do NOT change the links in the emails as they are already set to point to the Campaign Links. 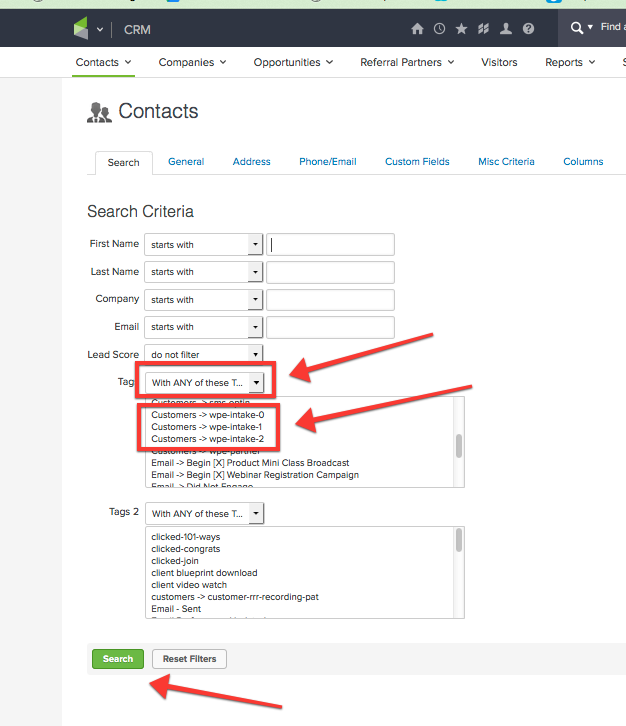 Just update the content of each of the emails (see the previous step #11 for how to update the email content). Finally, you might want to just double check the timers to make sure that each Day Before email is due to go out just under 24 hours before the call and that each 30 Mins email is due to go out 30 minutes before the call. Use World Time Buddy to double check the timers and take into account daylight savings. 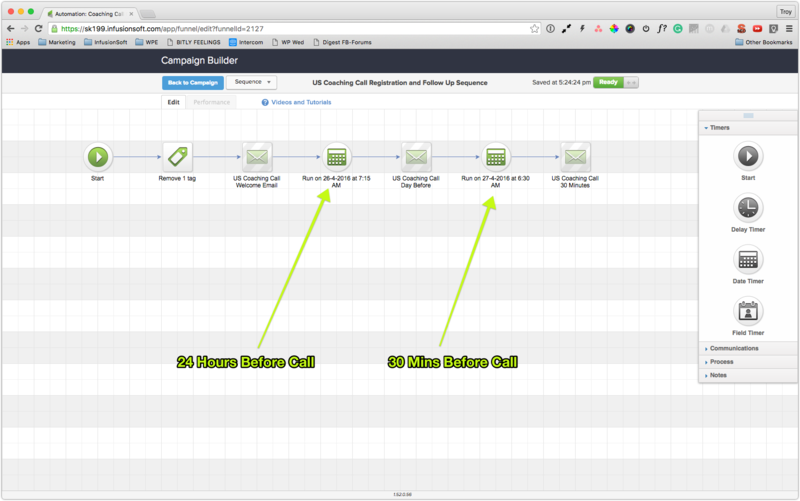 All timers in the Infusionsoft campaigns should be set to run according to Pacific US Time (Los Angeles). If you need any assistance with this, please contact Troy Dean. Check these details to make sure the 24 hour and 30 minute reminder emails go out at the right times. 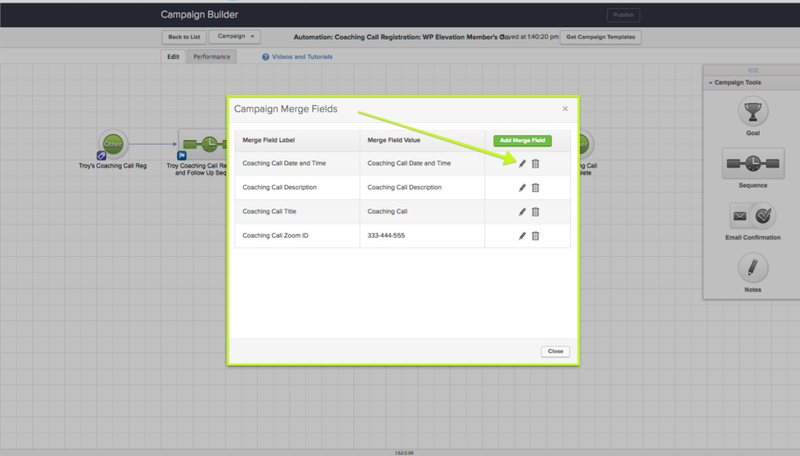 The mechanism for actually sending the emails to our members to invite them to the call, is to tag them in Infusionsoft with the correct tag to trigger the campaign. 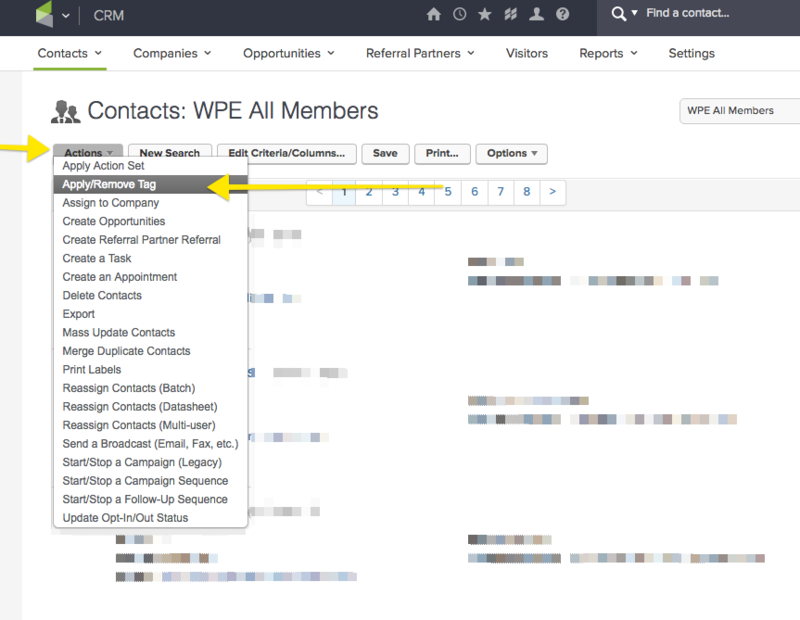 Login to Infusionsoft and navigate to CRM > Contacts and choose WPE All Members from the Saved Search dropdown. 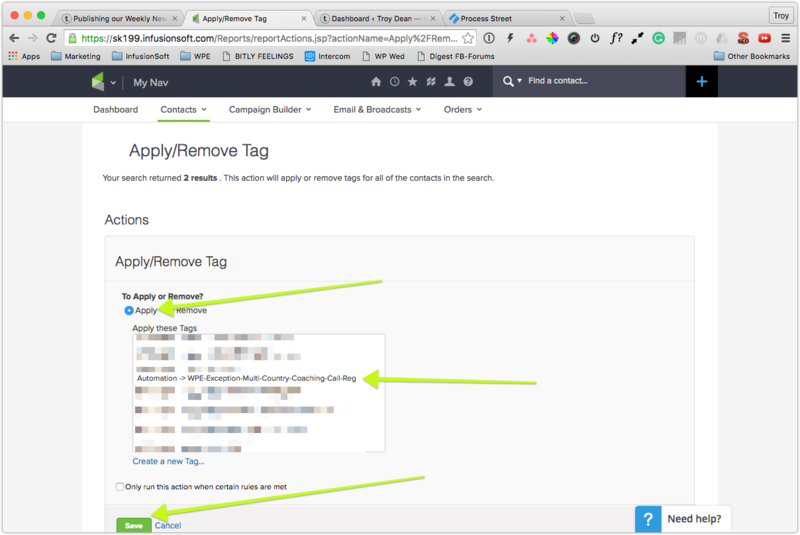 Make sure all contacts are ticked and then choose Apply/Remove Tag from the Actions dropdown. 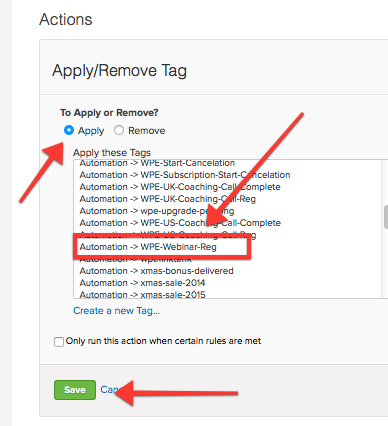 Choose Apply and select the Automation > WPE-Coaching-Call Reg tag from the list of tags. Then click Save. 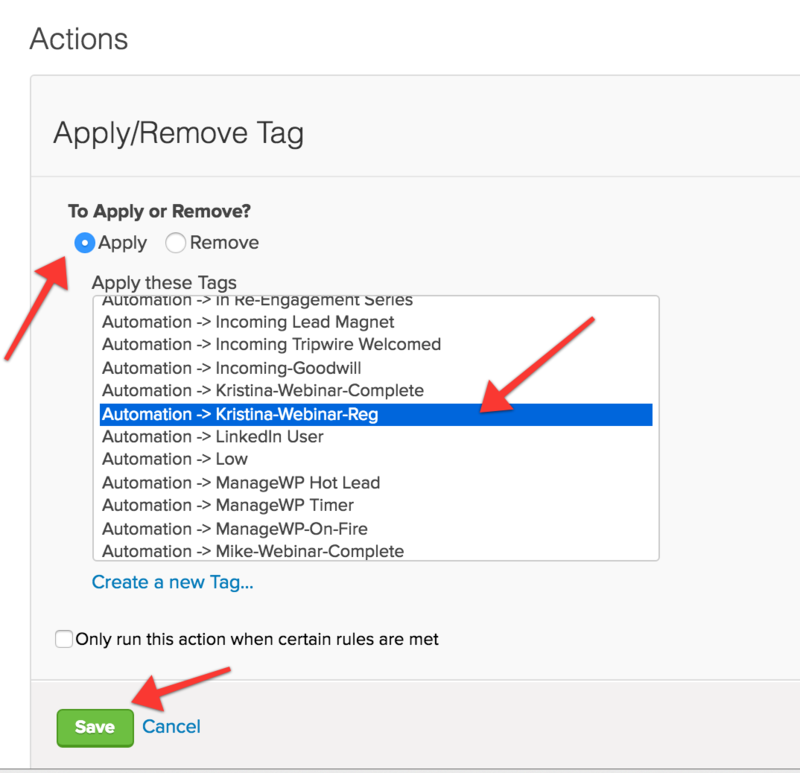 When you are satisfied you are about to apply the correct tag, click the Process Action button. 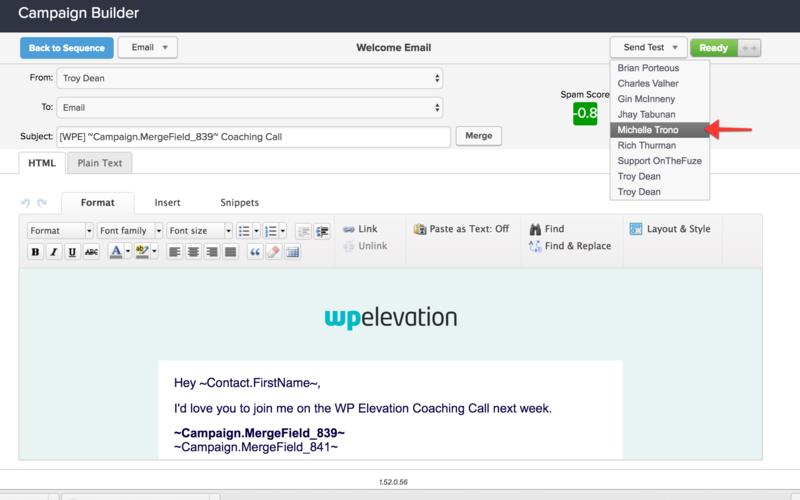 This will begin the process of tagging all active WP Elevation members with the correct tag to trigger the Registration and Follow Up Sequence so they all get emails inviting them to the coaching call. 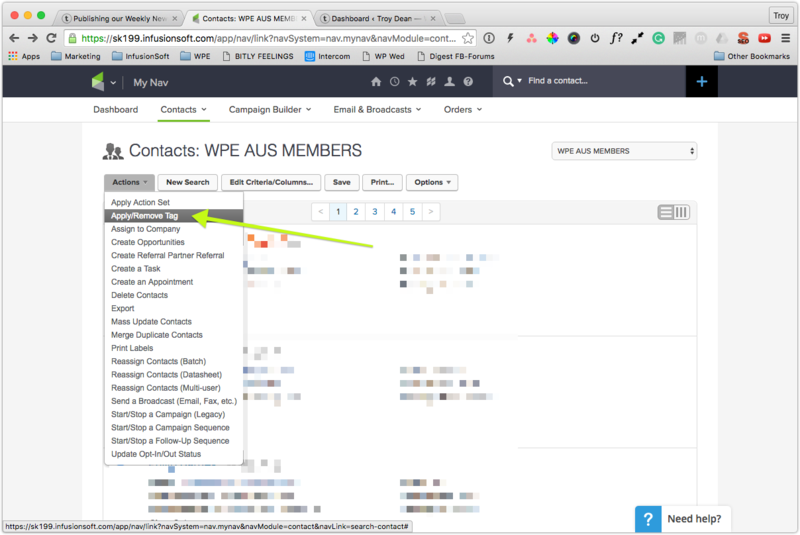 Login to Infusionsoft and navigate to CRM > Contacts and choose WPE AUS Members from the Saved Search dropdown to begin the registration of the AUSTRALIAN Coaching Call. 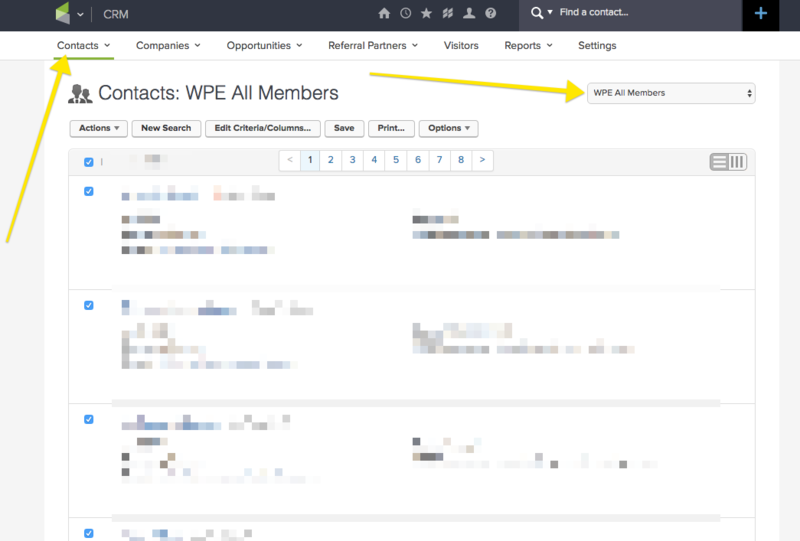 NB: To begin the the UK and US coaching calls you would choose the WPE UK Members and WPE US Members saved searches respectively. 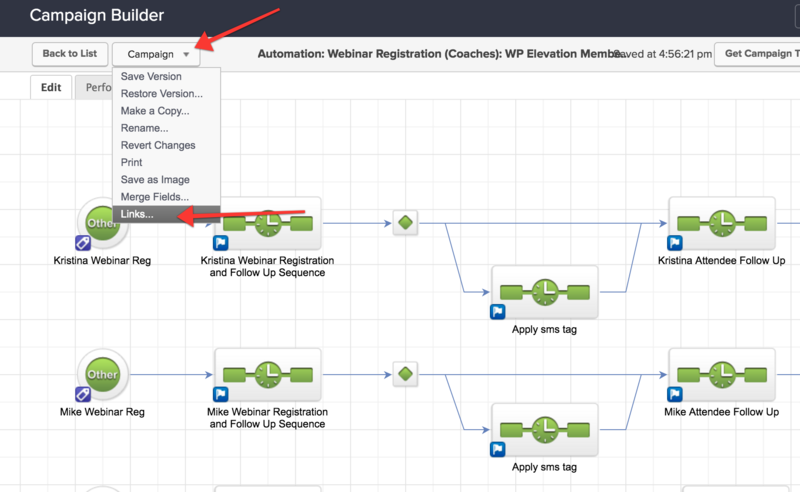 Choose Apply and select the Automation > WPE-AUS-Coaching-Call Reg tag from the list of tags. Then click Save. NB: Choose the WPE-UK-Coaching-Call-Reg and WPE-US-Coaching-Call-Reg tags to begin the UK and US registration processes. 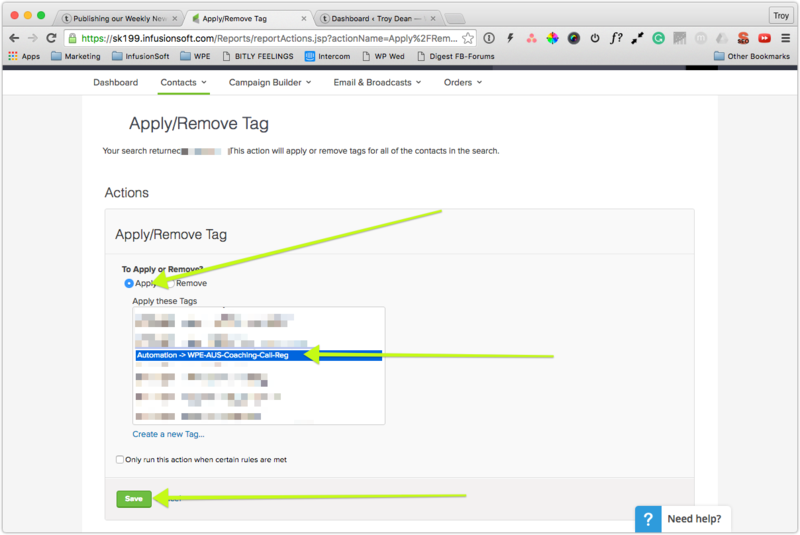 When you are satisfied you are about to apply the correct tag, click the Process Action button. 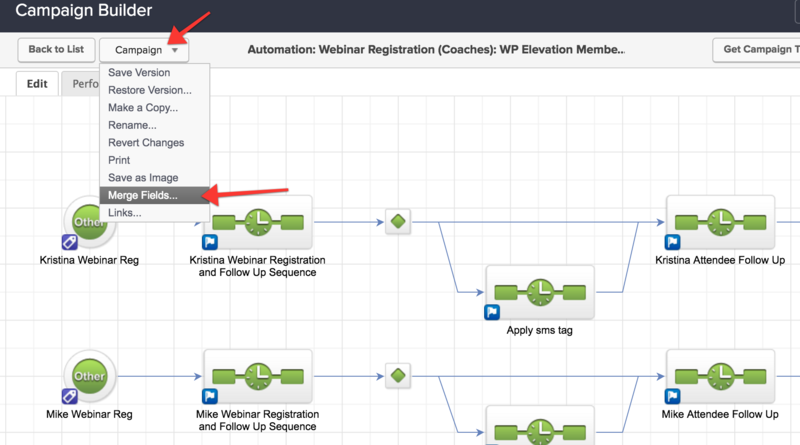 This will begin the process of tagging all relevant WP Elevation members for this specific geographic region with the correct tag to trigger the Registration and Follow Up Sequence so they all get emails inviting them to the correct coaching call. There are a handful of members who prefer to to attend coaching calls that are not specifically in their region. EG: Members in Hawaii prefer to be on Australian coaching calls, because the US coaching calls run at approx. 4am for our Hawaiian friends. 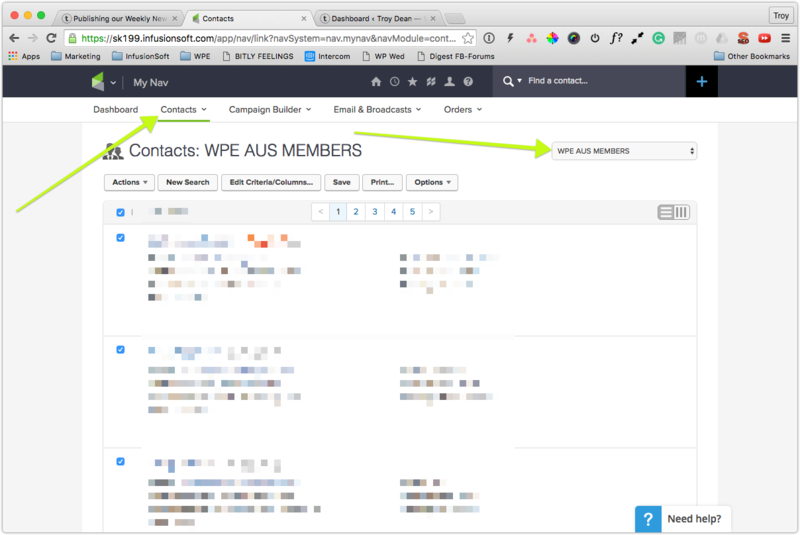 In this case, we have manually tagged these members with the tags WPE-Exception-Multi-Country-Coaching-Call-Reg and WPE-Multi-Country-AUS. The campaign is also setup to recognise these tags and register these members for correct coaching call based on their preference. So the final piece of this puzzle is to tag these few members. 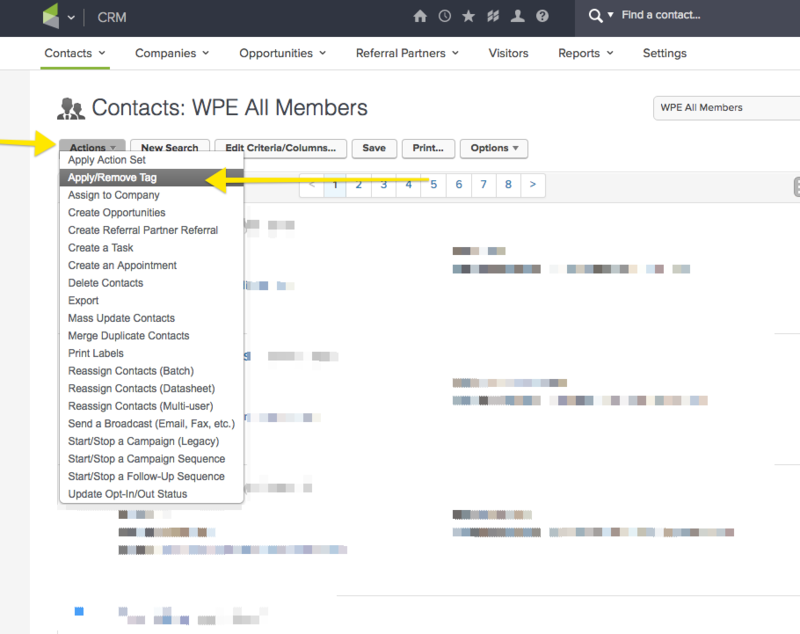 Login to Infusionsoft and navigate to CRM > Contacts and choose WPE EXCEPTION COUNTRY MEMBERS from the Saved Search dropdown to begin the registration of the Coaching Call. 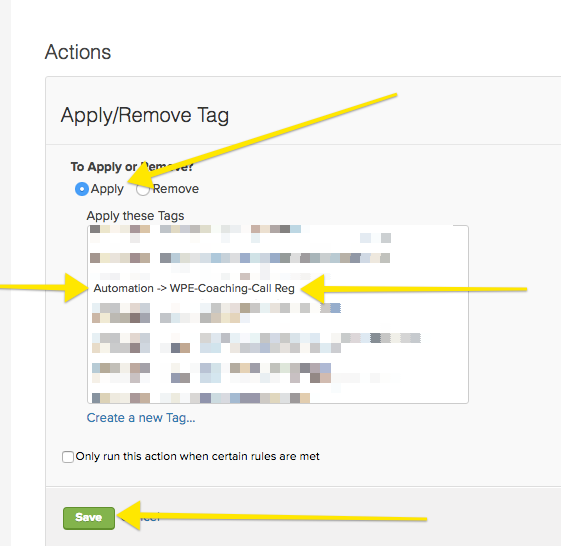 Choose Apply and select the Automation > WPE-Exception-Multi-Country-Coaching-Call-Reg tag from the list of tags. Then click Save. 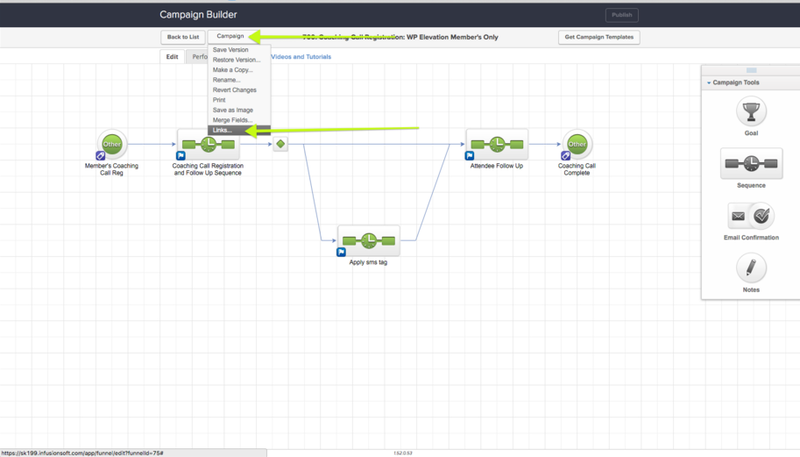 Tagging for webinars will vary depending on whether or not the Blueprint course is in progress. Over the 7 weeks of the Blueprint course, we DO NOT include the new members in the webinars because we want their focus to be solely on the course and course Coaching Calls. Tag every intake apart from the current Blueprint intake eg. Intake 0, Intake 1, Intake 2 but not Intake 3. 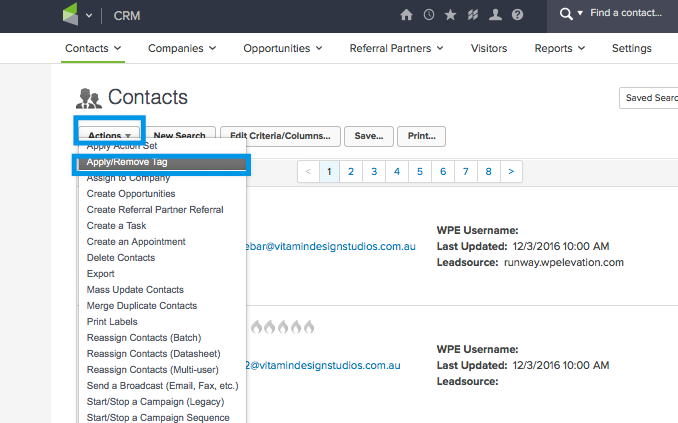 So from "Contacts" select the intakes that you want the email sent to. Then hit "Search." 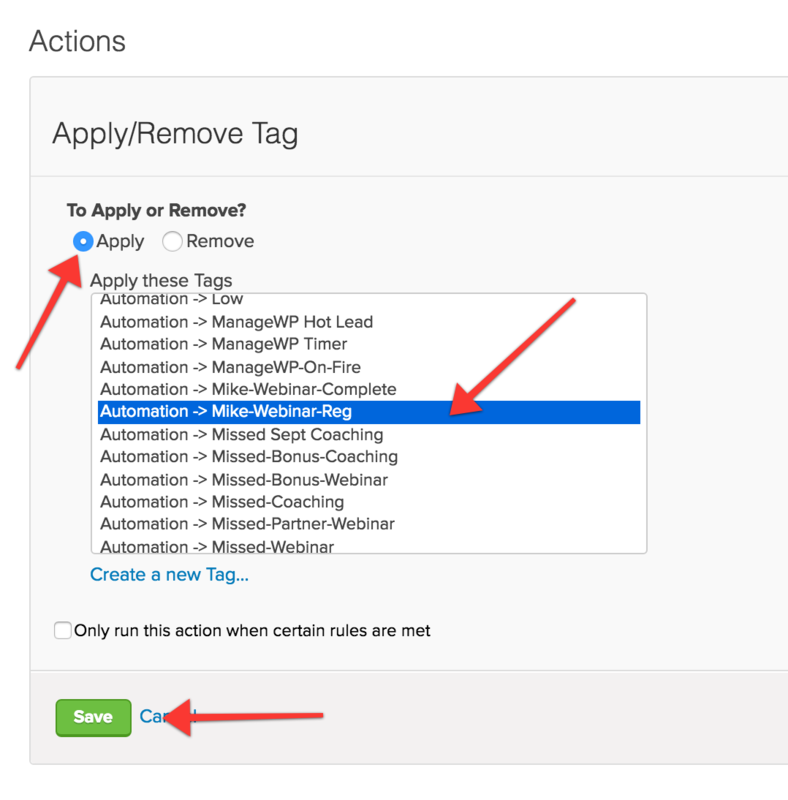 Then from the top menu, choose the drop down "Action" > "Apply/Remove Tags"
Then like in the above calls, when you are satisfied you are about to apply the correct tag, click the Process Action button. 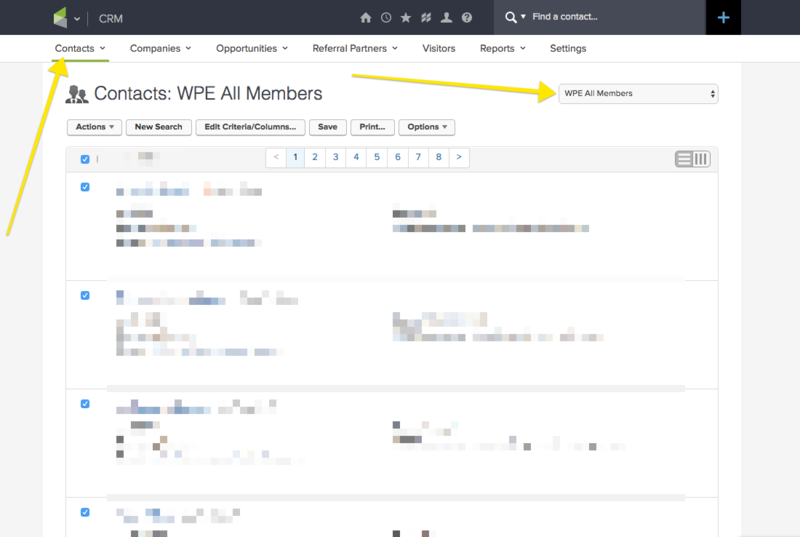 This will begin the process of tagging all relevant WP Elevation members. Blueprint course NOT in progress? 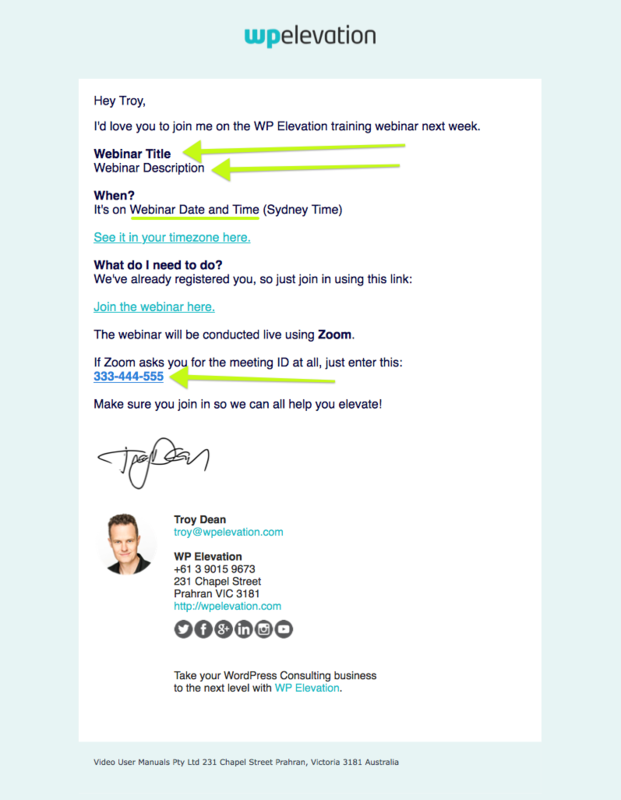 For the webinar set up the process will be the same as for Troy's Coaching Call - where we choose all WPE members, but instead of choosing the tag of "Automation: WPE Coaching Call Reg", we will choose "Automation: WPE-Webinar-Reg"
For the coaches webinar tagging process will be the same as for Troy's webinar - where we choose WPE All Members, but our tag will depend on which among the host will be leading the webinar. Once you have set up the call in Zoom, updated the campaigns and tagged all the correct members in Infusionsoft, it is essential that you update the task in Asana by adding the tag "call-created". This will automatically create a checklist and task for our designer to find an image from our Bigstockphoto.com library for the video recording of the call and prepare the images so the are ready for when the call is uploaded to the members' website. 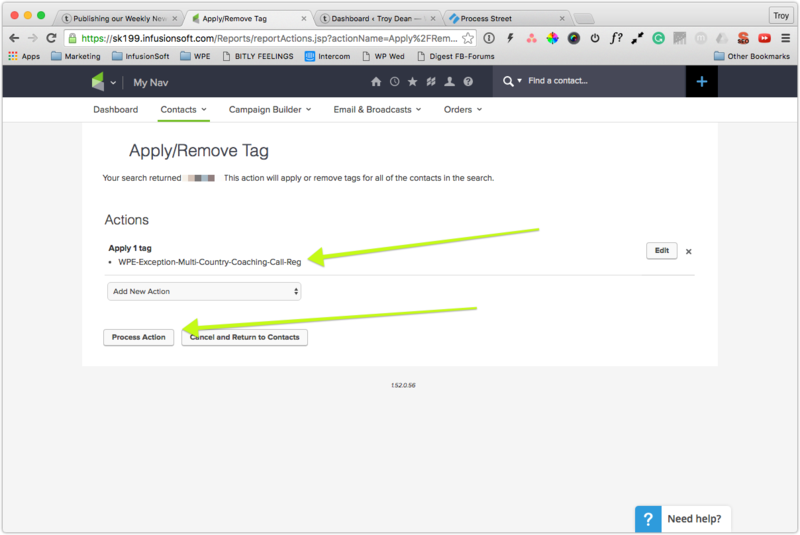 In Asana, find the task for the call, click the Plus sign next to the list of tags, type "call" in the field and then choose "call-created" from the dropdown list. NB: Please make sure you remember this step. 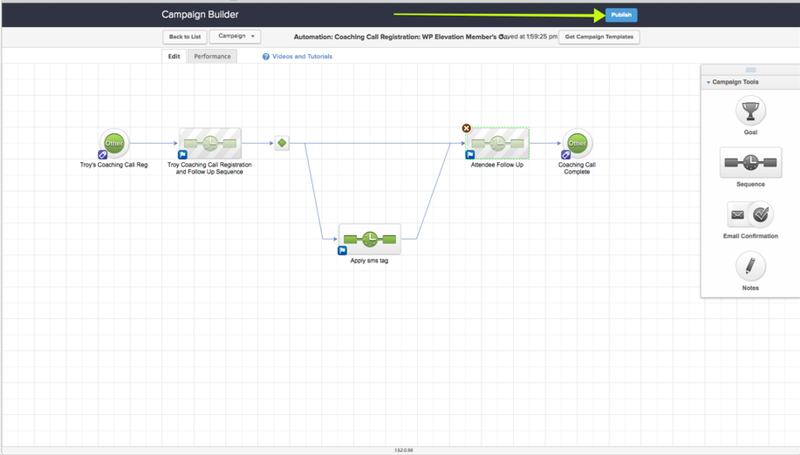 You will know you have completed this process when you check the correct Infusionsoft campaign in Performance mode and you can see that members have been added to the welcome and follow up sequences in either the Coaching Call, Multi Coaching Call or Webinar Campaigns. Stand up and go for a walk. You deserve it.